Stream anime episodes online for free, Watch One piece Episode 119 English version online and free episodes. Anime Episode guide One piece Episode 119 English dubbed Secret of Powerful Swordplay! Ability to Cut Steel and the Rhythm Things Have! 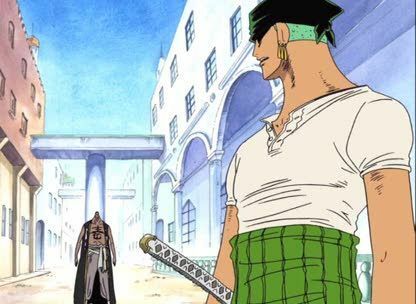 Zoro struggles against Mr. 1 as his attacks have no effect on his steel body, but Mr. 1’s Dice Dice Fruit enables him to attack by using any part of his body as a steel blade. After Mr. 1 severely wounds Zoro, he becomes able to sense the rhythm that all things have, enabling to cut or not cut at will, and allowing him to defeat Mr. 1 with a single slash.